This week went by quickly. Because Monday was a holiday, I enjoyed a three-day weekend. I wish I could say I was more productive as a result, but at least the week itself was, for me, a successful accomplishment of my writing goals. This week was the first with all green indicators for daily progress. Using Excel conditional formatting, I created a rule to change the indicator from red to yellow when any words are written for a specific day, and from yellow to green when the 1,000-word threshold is crossed. This week also marks by highest number of words written on one day, 1,739 words on the 18th. In the My 500 Words challenge, I wrote over 500 words per day, but stopped writing when I reached my goal of 60,000. For the Writing 365 challenge, my goal is to write 1,000 words per day for a total of 365 days, slightly different than just writing 365,000 words. The cumulative total will, I believe, be over 400,000 words. For me, the key is to continue a daily writing habit. Since initiating the Writing 365 project I have not spent as much time on the Bible project, writing out the Bible in it's entirety. I am still working to find the time balance to keep the momentum going here as well. 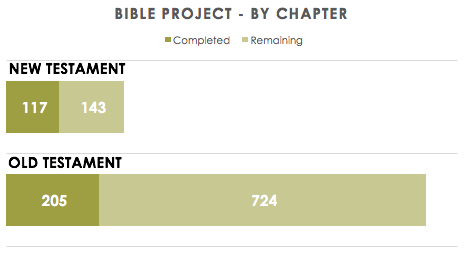 When I conceived of the Bible project, my goal was to write a minimum of ten verses per day. Most of what I'm writing about now is the plot map of the tribes of Israel; the texts mostly contain geographical markers. Once I can press through the middle part of Joshua, the story aspect of the Bible picks up again. I have often read that engaging in the same activity for 21 days locks it in as a habit. While there are other factors to consider before something becomes a habit. As I have been writing daily for 21 plus days, at least one milestone has been reached.